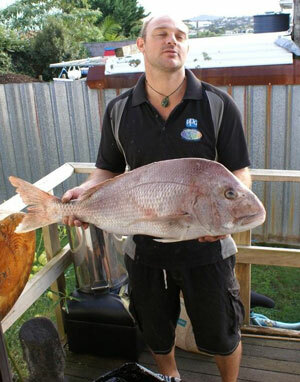 Paul Barnes is planning a mid week fishing trip to Muriwai Beach early next week. Easterlies are predicted from Monday to next Saturday. Paul will take two kite fishing rigs and be demonstrating novel techniques and specialist kites and rigs. If you are interested put your name forward here, Free Fishing Trip Registration. You will be contacted a day or two before the trip. It looks like the easterlies will blow for a week or more. Register for the FREE KITE FISHING DEMO here! I put my Super Kite out about 1500 yards from our place on Pakiri Beach in December. I decided to troll a 9 inch Tsunami Swim Shad (Chartreuse/Silver) with a 15 foot leader. Out of interest, I use a handspool with 150lb breaking strain yellow Power Pro braid as a main line. Well, anyway, after I got out the 1500 yards I wound it in a couple of hundred yards and then let it out again, and after a few times of this 'yo-yoing' I pulled it in and ended up with a nice snapper of about 18-20 pounds. Photo right: Trolling with softbaits makes a lot of sense. Kahawai, kingfish and john dory are other likely catches on softbaits. I got this 20lbs plus snapper at Ocean Beach at Whangarei Heads. I used mullet for bait and put the Mega Mouth Kite out about 900 metres offshore where we could see a big boil up with the birds diving for bait fish. I set the gear right into it and left it for 15-20 minutes to fish. When we hauled it in we had six big ocean going kahawai. I quickly cut some of them up into big baits and put the gear back out to around 1500 metres for an hour and a half. We only caught one fish but it was a beauty. Thanks to Pauls Fishing Kites for selling me top fishing gear that catches me big fish all the time.